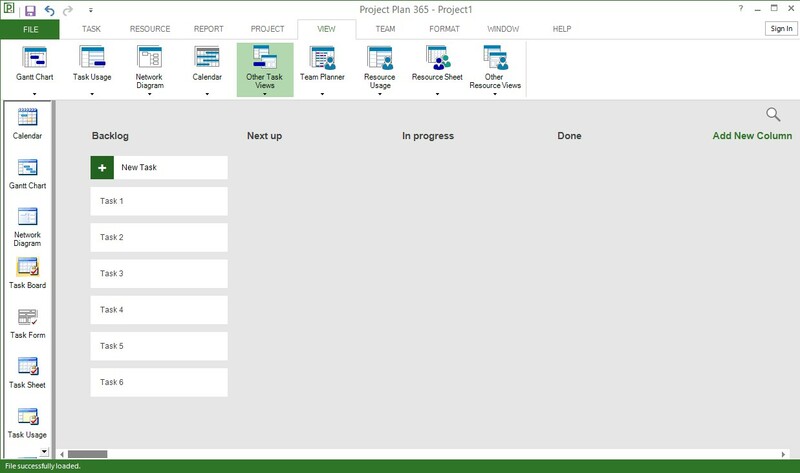 In Project Plan 365 you can use agile project management to track your projects. You can create new agile projects or turn on agile views for an existing project (traditional "waterfall" project). To create a new agile project, go to File → New and choose Scrum Project or Kanban Project (Figure 1). Scrum and Kanban are two agile methodologies – Scrum uses sprints (time-boxed iterations, typically two weeks long) to organize tasks and allows for quick goal shifting, while Kanban uses a backlog and board statuses to manage work in progress. Choosing any of them will enable a ribbon tab (Scrum or Kanban) with slightly different options (Figure 2 and Figure 3). 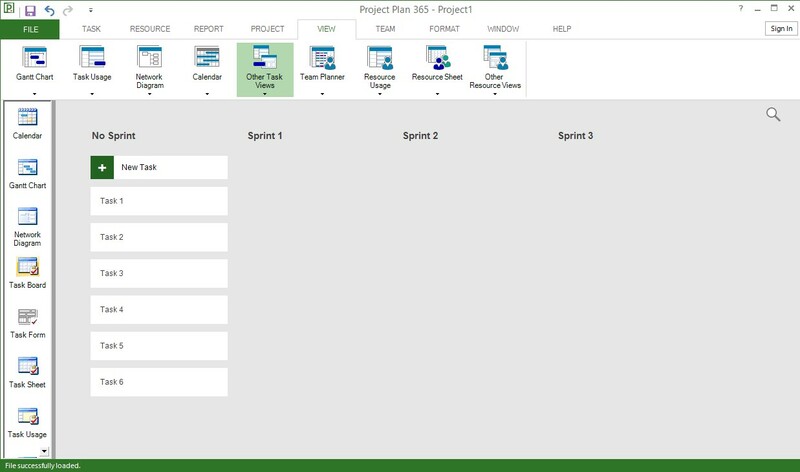 You can enable agile for an existing (traditional "waterfall") project by going to Project ribbon tab and click on Agile button (Figure 4). 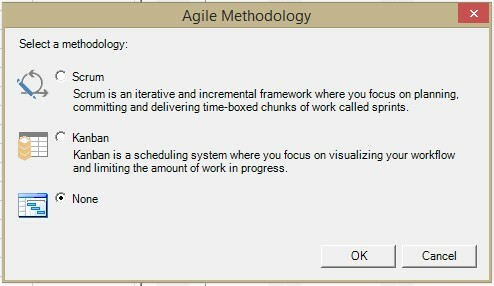 Once you click on Agile button the Agile Methodology dialog will show (Figure 5). This dialog will give you three options – Scrum (add Scrum to the current project), Kanban (add Kanban to the current project) and None (remove agile from current project). You can also use this dialog to switch from one methodology to the other. Removing or switching the agile methodology from a project will not remove agile related data. This means that even if your project's agile methodology is set to None you will still be able to visualize and modify agile related data (sprints, board statuses, agile views). Sheet-based views allow tabular display using predefined tables and filters, while board-based views provide a more visual representation of the agile project – tasks are organized on board columns that can be either sprints (Figure 6) or statuses (Figure 7). To create an agile project in Project Plan 365, you first need to add tasks to the backlog, then assign tasks to sprints (Scrum only), and finally move tasks across the board as your team works on and completes them. You can see all of your agile tasks in the Gantt chart view and manage them using both traditional waterfall methods and agile methods. You can also run only a subset of a traditional project using an agile method. See manage your agile tasks in the Gantt chart. Your backlog for a project is the list of tasks that your team maintains related to the accomplishment of that project. In Kanban and Scrum, this will be one large prioritized list. On the Scrum tab, choose Planning, then Sprint Planning Board. On the Kanban tab, choose Backlog, then Backlog Board. In the first column, either No Sprint for Scrum or Backlog for Kanban, select New Task, type a task name, and then choose Add or press Enter. 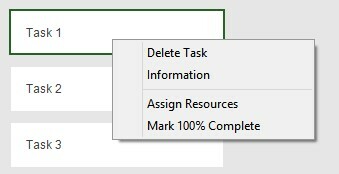 You can move tasks across the board (Figure 11) to either update their board status, to assign the selected task to a specific sprint (Figure 12) or to reorder them in the current board column. 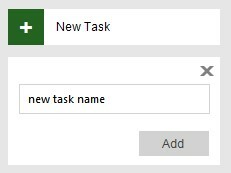 To move a task just click on it and drag on the desired position (drag-and-drop). Figure 11: Update board status of "Task 1" from "Backlog" to "Next up"
Figure 12: Assign "Task 2" to sprint "Sprint 1"
To exit/discard a search just click on the "X" symbol. Only empty board columns can be deleted. To manage sprints, you need to open the Manage Sprints dialog (Figure 16) (Scrum → Manage or Sprint Planning Board → Right click on sprint title → Manage Sprints). 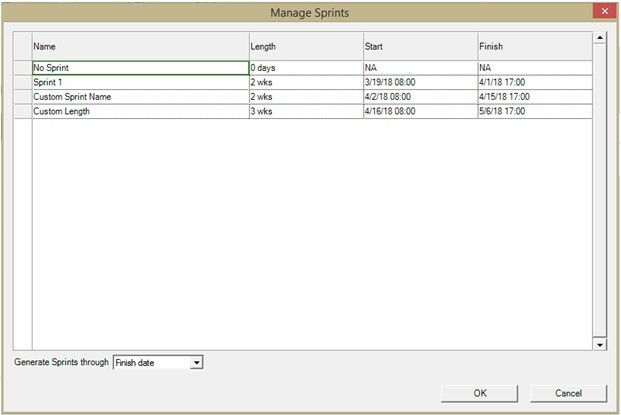 You can customize your sprints name, length and start date of the first sprint. Project Plan 365 will automatically generate start and finish dates for the rest of your sprints based on the start date of your first sprint. By default, Project Plan 365 generates sprints through project's finish date. Once you finished editing your sprints click OK to apply your changes. The custom date selected must be after the first sprint's start date, else you will receive an error message.